Protected content here and we are ready to announce our first coming event this year: Escape Rooms challenge!!! We have chosen an amazing location where we will first mingle, have some pizzas + drinks, and then we will be divided in teams of Protected content and we will have to escape from different Escape Rooms. 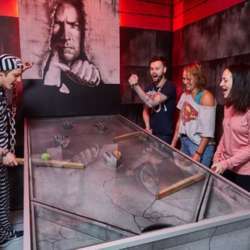 The Escape Rooms we choose differ from all the other Escape locations. First of all it’s the world’s biggest Escape Rooms location which includes 45 different cells. Have you ever seen a serial “Prison Island”? It has been on the TV for many years and now it’s time to try all these challenges in the reality. There is a need for all kinds of qualities and talents, both physical, knowledge and psychological. So there is something suitable for everyone, regardless of physical form and age. The cells have different degrees of difficulty and include: balance, calculation, logic, strength, math knowledge and memory. Drinks have to be paid separately. We have booked a table for 12 , so we meet up kl. 18:30 to get to know each other and drink/eat. The game starts at 19:30 and will last 2 hours. To book a place please transfer Protected content to Arina (Protected content ). The deadline for transfer is 21st of January for those who are confirmed attendees. We will open waiting list on 22nd of January if there are still some spots that are not secured(not paid). As there's a strict cancellation policy at the place we have to close the list on Friday 25th of January at noon time.